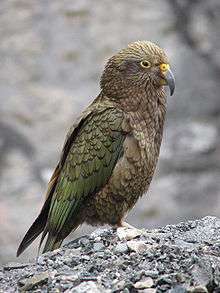 Kea are known for their intelligence and curiosity, both vital traits for survival in the harsh mountain environment that is their home. Kea can solve logical puzzles, such as pushing and pulling things in a certain order to get to food, and will work together to achieve a certain objective. Bird intelligence deals with the definition of intelligence and its measurement as it applies to birds. Traditionally, birds have been considered inferior in intelligence to humans, and derogatory terms such as bird brains have been used colloquially in some cultures. The difficulty of defining or measuring intelligence in non-human animals makes the subject difficult for scientific study. Anatomically, a bird has a relatively large brain compared to its head size. The visual and auditory senses are well developed in most species, while the tactile and olfactory senses are well realized only in a few groups. Birds communicate using visual signals as well as through the use of calls and song. The testing of intelligence is therefore based on studying the responses to sensory stimuli. Bird intelligence has been studied through several attributes and abilities. Many of these studies have been on birds such as quail, domestic fowl and pigeons kept under captive conditions. It has, however, been noted that field studies have been limited, unlike those of the apes. Birds in the crow family (corvids), and parrots (psittacines) have been shown to live socially, have long developmental periods, and possess large forebrains, and these may be expected to allow for greater cognitive abilities. Counting has been considered an ability that shows intelligence. Anecdotal evidence from the '60s has suggested that crows may count up to 3. Researchers however need to be cautious and ensure that birds are not merely demonstrating the ability to subitize, or count a small number of items quickly. Some studies, such as one done at Moscow State University, have suggested that crows may indeed have a true numerical ability. It has been shown that parrots can count up to 6. In the 1970s, on the Li River, Pamela Egremont observed fishermen who allowed the birds to eat every eighth fish they caught. Writing in the Biological Journal of the Linnean Society, she reported that, once their quota of seven fish was filled, the birds "stubbornly refuse to move again until their neck ring is loosened. They ignore an order to dive and even resist a rough push or a knock, sitting glum and motionless on their perches." Meanwhile, other birds that had not filled their quotas continued to catch fish as usual. "One is forced to conclude that these highly intelligent birds can count up to seven," she wrote. Many birds are also able to detect changes in the number of eggs in their nest and brood. Parasitic cuckoos are often known to remove one of the host eggs before laying their own. Visual or auditory signals and their association with food and other rewards have been well studied, and birds have been trained to recognize and distinguish complex shapes. This is probably an important ability that aids their survival. A common test of intelligence is the detour test, where a glass barrier between the bird and an item such as food is used in the setup. Most mammals discover that the objective is reached by first going away from the target. Whereas domestic fowl fail on this test, many within the crow family are able to readily solve the problem. Large fruit-eating birds in tropical forests depend on trees which bear fruit at different times of the year. Many species, such as pigeons and hornbills, have been shown to be able to decide upon foraging areas according to the time of the year. Birds that show food hoarding behavior have also shown the ability to recollect the locations of food caches. Nectarivorous birds such as hummingbirds also optimize their foraging by keeping track of the locations of good and bad flowers. Studies of western scrub jays also suggest that birds may be able to plan ahead. They cache food according to future needs and risk of not being able to find the food on subsequent days. Many birds follow strict time schedules in their activities. These are often dependent upon environmental cues. Birds also are sensitive to day length, and this awareness is especially important as a cue for migratory species. The ability to orient themselves during migrations is attributed to birds' superior sensory abilities, rather than to intelligence. Research published in 2008 that was conducted with an Eleonora cockatoo named Snowball has shown that birds can identify the beat of man-made music, an ability known as beat induction. The mirror test allows scientists to determine whether birds are conscious of themselves and able to distinguish themselves from other animals by determining whether they possess or lack the ability to recognize themselves in their own reflections. European magpies are the only animals beside mammals that have been shown to be able to pass this test by trying to remove colored stickers from underneath their beaks when shown in a mirror. However, in 1981, Epstein, Lanza and Skinner published a paper in the journal Science in which they argued that pigeons also pass the mirror test. A pigeon was trained to look in a mirror to find a response key behind it which it then turned to peck—food was the consequence of a correct choice (i.e., the pigeon learned to use a mirror to find critical elements of its environment). Next, the bird was trained to peck at dots placed on its feathers; food was, again, the consequence of touching the dot. This was done without a mirror. Then a small bib was placed on the pigeon—enough to cover a dot placed on its lower belly. A control period without the mirror yielded no pecking at the dot. But when the mirror was shown, the pigeon became active, looked into it and then tried to peck on the dot under the bib. Untrained pigeons have never been able to pass the mirror test. However, pigeons do not normally have access to mirrors and do not have the necessary experiences to use them. Giving a pigeon this experience in no way guaranteed it would pass the mirror test, since the pigeon never pecked dots on its own body in the presence of the mirror (until the final test). Despite this, the birds are not classified as being able to recognize their reflection, because those that did were trained to do so and the animal must be able to do this without human assistance: it must also be shown that the birds are able to do this in the wild with no experience, just on their own intelligence. But even when an animal is trained to do this, it is still unknown if they are self-aware, or are just repeating the same movements and commands that they were taught so that they may receive a treat as a reward after they have correctly completed their task. The woodpecker finch using a stick to impale a grub, with a second image showing it had successfully captured it. By this definition, a bearded vulture (lammergeier) dropping a bone on a rock would not be using a tool since the rock cannot be seen as an extension of the body. However the use of a rock manipulated using the beak to crack an ostrich egg would qualify the Egyptian vulture as a tool user. Many other species, including parrots, corvids and a range of passerines, have been noted as tool users. New Caledonian crows have been observed in the wild to use sticks with their beaks to extract insects from logs. While young birds in the wild normally learn this technique from elders, a laboratory crow named "Betty" improvised a hooked tool from a wire with no prior experience. The woodpecker finch from the Galapagos Islands also uses simple stick tools to assist it in obtaining food. In captivity, a young large cactus finch learned to imitate this behavior by watching a woodpecker finch in an adjacent cage. Crows in urban Japan have innovated a technique to crack hard-shelled nuts by dropping them onto crosswalks and letting them be run over and cracked by cars. They then retrieve the cracked nuts when the cars are stopped at the red light. Macaws have been shown to utilize rope to fetch items that would normally be difficult to reach. Striated herons (Butorides striatus) use bait to catch fish. Using rewards to reinforce responses is often used in laboratories to test intelligence. However, the ability of animals to learn by observation and imitation is considered more significant. Crows have been noted for their ability to learn from each other. At the beginning of the 20th century, scientists argued that the birds had hyper-developed basal ganglia, with tiny mammalian-like telencephalon structures. Modern studies have refuted this view. The basal ganglia only occupy a small part of the avian brain. Instead, it seems that birds use a different part of their brain, the medio-rostral neostriatum/hyperstriatum ventrale (see also nidopallium), as the seat of their intelligence, and the brain-to-body size ratio of psittacines (parrots) and corvines (birds of the crow family) is actually comparable to that of higher primates. Studies with captive birds have given insight into which birds are the most intelligent. While parrots have the distinction of being able to mimic human speech, studies with the African grey parrot have shown that some are able to associate words with their meanings and form simple sentences (see Alex). Parrots and the corvid family of crows, ravens, and jays are considered the most intelligent of birds. Not surprisingly, research has shown that these species tend to have the largest HVCs. Dr. Harvey J. Karten, a neuroscientist at UCSD who has studied the physiology of birds, has discovered that the lower parts of avian brains are similar to those of humans. Social life has been considered to be a driving force for the evolution of intelligence. Many birds have social organizations, and loose aggregations are common. Many corvid species separate into small family groups (or "clans") for activities such as nesting and territorial defense. The birds then congregate in massive flocks made up of several different species for migratory purposes. Some birds use teamwork while hunting. Predatory birds hunting in pairs have been observed using a "bait and switch" technique, whereby one bird will distract the prey while the other swoops in for the kill. Social behavior requires individual identification, and most birds appear to be capable of recognizing mates, siblings and young. Other behaviors such as play and cooperative breeding are also considered indicators of intelligence. When crows are caching food, they appear to be sensitive to note who is watching them hide the food. They also steal food caught by others. In some fairy-wrens such as the superb and red-backed, males pick flower petals in colors contrasting with their bright nuptial plumage and present them to others of their species that will acknowledge, inspect and sometimes manipulate the petals. This function seems not linked to sexual or aggressive activity in the short and medium term thereafter, though its function is apparently not aggressive and quite possibly sexual. Birds communicate with their flockmates through song, calls, and body language. Studies have shown that the intricate territorial songs of some birds must be learned at an early age, and that the memory of the song will serve the bird for the rest of its life. Some bird species are able to communicate in several regional varieties of their songs. For example, the New Zealand saddleback will learn the different song "dialects" of clans of its own species, much as human beings might acquire diverse regional dialects. When a territory-owning male of the species dies, a young male will immediately take his place, singing to prospective mates in the dialect appropriate to the territory he is in. Similarly, with around 300 calls the male tūī also uses this ability to attract female birds. An analysis by a group at Massey University is that they are the most intelligent bird in not blurting. They theorize that 'each baronial song has a reason' whether this is knowledge is abstruse. Garbled, if identified could also help in population decline, expatriation and conservation, quoting Mr Hill "The greater the competition in the area, then the more likely the birds are to actually create or make their song more complex,". Recent studies indicate that some birds may have an ability to memorize "syntactic" patterns of sounds, and that they can be taught to reject the ones determined to be incorrect by the human trainers. This experiments were carried out by combining whistles, rattles, warbles, and high-frequency motifs. Evidence that birds can form abstract concepts such as same v. different has been provided by Alex, the African grey parrot. Alex was trained by animal psychologist Irene Pepperberg to vocally label more than 100 objects of different colors and shapes and which are made from different materials. Alex could also request or refuse these objects ('I want X') and quantify numbers of them. Macaws have been demonstrated to fully comprehend the concept of object permanence at a young age. They will even refute the "A-not-B error". If they are shown an item, especially one with whose purpose they are familiar—they will search logically for where it could be feasibly placed. One test for YouTube was done as follows: A macaw was shown an item; the item was then hidden behind the back of the trainer and placed into a container. The container it was placed in without the macaw seeing, along with another container and multiple objects, were spread upon a table simultaneously. The specific container that the item was stored in out of the macaws' sight was one that the macaw had never observed before. The macaw searched this some, then another container, then returning to open the correct container to demonstrate knowledge of and the ability to search for the item. A study on the little green bee-eater suggests that these birds may be able to see from the point of view of a predator. The brown-necked raven has been observed hunting lizards in complex cooperation with other ravens, demonstrating an apparent understanding of prey behavior. The California scrub jay hides caches of food and will later re-hide food if it was watched by another bird the first time, but only if the bird hiding the food has itself stolen food before from a cache. Such an ability to see from the point of view of another individual had previously been attributed only to the great apes and sometimes elephants. Such abilities form the basis for empathy. ↑ Rand, Ayn 1967. Introduction to Objectivist Epistemology. New York: The Objectivist. ↑ Hurford, James (2007). The Origins of Meaning: Language in the Light of Evolution. New York: Oxford University Press. ISBN 0-19-920785-2. ↑ Miller, D. J. (1993). Do animals subitize? In S. T. Boysen & E. J. Capaldi (Eds. ), The development of numerical competence: Animal and human models (pp. 149–169). Hillsdale, NJ: Erlbaum. ↑ Cook, Robert (2001). Avian Visual Cognition. http://pigeon.psy.tufts.edu/avc/: Department of Psychology, Tufts University, Comparative Cognition Press. pp. Birds' Judgments of Number and Quality. ↑ Carter, D. E. & Eckerman, D. A. 1975 Symbolic matching by pigeons: rate of learning complex discriminations predicted from simple discriminations. Science 187, 662–664. ↑ Scott, John P. 1972. Animal Behavior. Univ. of Chicago Press. Chicago, Ill. p. 193. ↑ Kamil, A., and R. Balda. 1985. Cache recovery and spatial memory in Clark's nutcrackers (Nucifraga columbiana). Journal of Experimental Psychology and Animal Behavioral Processes 11:95–111. ↑ Healy, S. D. & Hurly, T. A. 1995 Spatial memory in rufous hummingbirds (Selasphorus rufus): a field test. Anim. Learn. Behav. 23, 63–68. ↑ Jones, T. B. & Kamil, A. C. 1973 Tool-making and tool-using in the northern blue jay. Science 180, 1076–1078. ↑ Robert Burton; Jane Burton; Kim Taylor (1985). Bird behavior. Knopf. p. 58. ISBN 978-0-394-53957-7. ↑ Pacific Discovery. 46 or 47. California Academy of Sciences. 1993. p. 10. ↑ Davis-Merlen, Gayle; Merlen, Godfrey (2000). "WHISH: More than a tool-using finch" (PDF). Notícias de Galápagos. 61: 3. ↑ "Gizzard uses a rope to retrieve a submerged gift, 10 second retrieval from noticing the rope". YouTube. 2011-06-20. Retrieved 2013-12-10. ↑ "Hyacinth Macaw-Cincinnati Zoo". YouTube. Retrieved 2013-12-10. ↑ Iwaniuk, A.N. ; Nelson, J.E. (2003). "Developmental differences are correlated with relative brain size in birds: A comparative analysis". Canadian Journal of Zoology. 81: 1913–1928. doi:10.1139/z03-190. ↑ Gentner, Timothy Q.; Fenn, Kimberly M.; Margoliash, Daniel; Nusbaum, Howard C. (2006). "Recursive syntactic pattern learning by songbirds". Nature. 440 (7088): 1204–1207. doi:10.1038/nature04675. PMC 2653278 . PMID 16641998. ↑ Pepperberg, I. M. 1999 The Alex studies: cognitive and communicative abilities of Grey parrots. Cambridge, MA: Harvard University Press. ↑ "Left and right progress Sept 27th, 2011". YouTube. 2011-09-27. Retrieved 2013-12-10. ↑ "Left and right shake progress Dec 18, 2011". YouTube. 2011-12-18. Retrieved 2013-12-10. ↑ "Object permanence demonstration 2". YouTube. 2011-12-18. Retrieved 2013-12-10. ↑ "Object permanance for our macaws- video documentation". YouTube. 2011-06-23. Retrieved 2013-12-10. ↑ Watve, Milind; Thakar, Juilee; Kale, Abhijit; Puntambekar, S; Shaikh, I; Vaze, K; Jog, M; Paranjape, S; et al. (December 2002). "Bee-eaters (Merops orientalis) respond to what a predator can see". Animal Cognition. 5 (4): 253–259. doi:10.1007/s10071-002-0155-6. PMID 12461603. Retrieved 7 April 2009. ↑ Yosef, Reuven; Yosef, Nufar (May 2010). "Cooperative hunting in Brown-Necked Raven (Corvus rufficollis) on Egyptian Mastigure (Uromastyx aegyptius)". Journal of Ethnology. 28 (2): 385–388. doi:10.1007/s10164-009-0191-7. Retrieved 20 September 2012. ↑ Clayton, Nichola S.; Joanna M Dally; Nathan J Emery (29 April 2007). "Social cognition by food-caching corvids. The western scrub-jay as a natural psychologist". Phil. Trans. R. Soc. B. Royal Society. 362 (1480): 507–522. doi:10.1098/rstb.2006.1992. PMC 2346514 . PMID 17309867.